A long time ago, a big lion was sleeping. 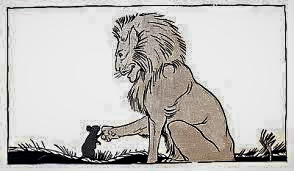 A small mouse ran on top of the lion’s face. This woke the lion up. And it made the lion very mad! He took the mouse up in his paw. He was going to eat the mouse. 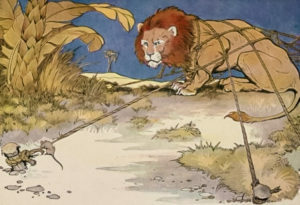 But five days later, some hunters got the lion in one of their traps. They were going to send him to a zoo. The lion could not get out. The ropes of the trap were very thick. The lion was very mad. And he felt scared and alone. He gave out a loud roar. The mouse was far away. But the lion’s roar was so loud that he heard it. He ran for an hour to find the lion. When he finally got to the trap, he chewed on the rope for a long time. 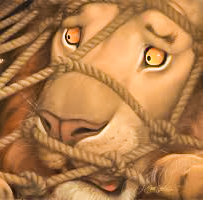 The rope broke and made a hole for the lion to get out. 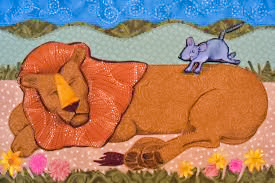 The mouse set the lion free, just like the lion had set the mouse free. 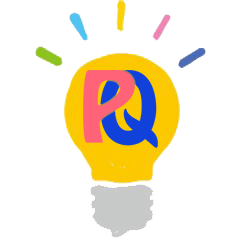 What we learn from this story is that no one is too weak to do a good thing. 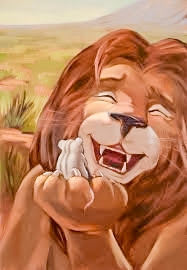 2) Why did the lion think the that what the mouse said was funny? 3) What happened to the lion? 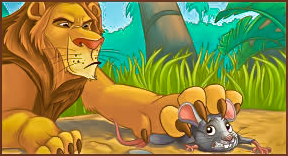 4) How did the mouse know that the lion needed help? 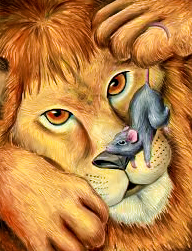 5) How did the mouse help the lion? 6) What did the trappers want to do with the lion?